The stage is set. Colourful carpets line the floor, creating a soft peninsula on a sea of cement. One by one, and sometimes in small groups, the participants come in, taking off their shoes and sitting down cross-legged to raise their chins at a pink-maned conductor whose baton-free hands clasp together as she counts off members of the crowd. 23 in all. On this Saturday afternoon, a jam, in nearly every sense of the word, is about to happen. They are here now for the next few hours, sharing real-estate of mismatched rugs and hand-woven Persian carpets, about to experience their first group improv - not in music, but in writing. As the session is about to start, a few are wondering if they had indeed walked into a real predicament on their free will. Despite the informal setting, the writer’s (or writing) jam has a structure, beginning with an ice-breaking exercise that requires writers to interview their neighbours to help them guess the contents of their bags. Narratives, please, not lists, says the co-organiser of the event, swathed in an also pink, but brighter, hijab. The point of the exercise was to develop characters, to familiarise with the imaginary and not-so-imagined personalities that writers write about. What’s in their fridge, hijabista had asked before the ice-breaker, and the writers had their first taste of ‘perhapsing’. 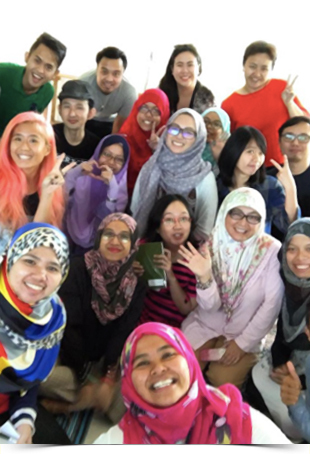 The duo behind this writer’s jam is Ying and Huwaida, of Heartwrite,who had been writing with a smaller group long before their Communications and Writing Services company was formed in November 2015. 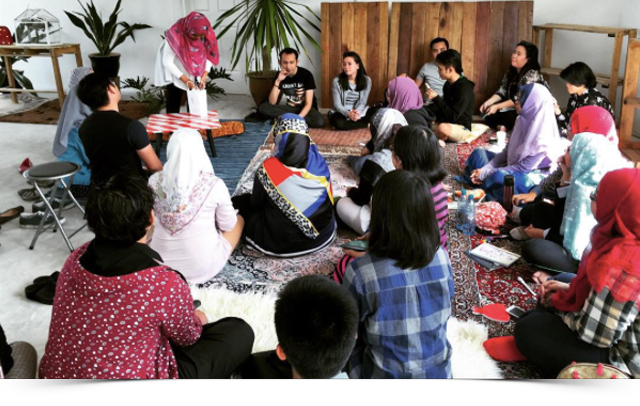 The reason the Heartwriters hold jams is to bring writers together, says Huwaida. "To try out new things, to write (it is incredibly easy to get caught up in NOT writing) and get feedback from fellow writers." Writing may be a solitary endeavour, but for most writers, a little support and camaraderie can be like a sprinkle of rain on a long summer’s day, adding new life and a fresh look to the landscape. More serious writers often have a supply of motivation from editors, and sometimes writing groups. A writing jam is only a burst of help, but Heartwrite intends to make it a consistent one by organising at least one session per month. The writer’s jams are open to all – that is to say, anyone who is interested in writing – from someone who writes for a living, and may be a published author, to someone whose last piece of writing was a composition or essay in secondary school. You come to a writer's jam if you want to write more, or better. It is a small qualifying criteria, but an important one. Follow Heartwrite on Instagram or Facebook to catch details on the next sessions! The contents on the BruneiONS site are intended for your personal, noncommercial use. All copyright, trade marks, design rights, patents and other intellectual property rights (registered and unregistered) on BruneiONS belong to Bruneions and/or third parties. All materials published here (including but not limited to articles, photographs, images, illustrations also known as the 'Content') are protected by copyright, and owned or controlled by BruneiONS or the party credited as the provider of the Content. Copying, publishing or distribution of any content for use other than personal is prohibited without prior written permission from BruneiONS. Opinions and views by contributors or interviews with guests are personal views and may not be shared by the BruneiONS. Personal information revealed through submissions to the Social Calender will be kept confidential except where disclosure is required or permitted by law. BruneiONS will not contact you for marketing purposes, promote news services, activities or online content unless you specifically agree to be contacted for these purposes. BruneiONS contain hyperlinks to websites owned and operated by third parties. We do not accept any responsibility or liability for the privacy practices of third party websites and your use of such websites is at your own risk.